To facilitate communication, interaction and building community amongst staff members, AU has developed a secure web portal known as myAU – Staff. The idea is simple: myAU – Staff centralizes in one convenient online location all of the primary web-based services that staff members typically require. Only active AU staff members can access the myAU – Staff portal. You can log in to myAU – Staff by clicking the Log-in button at the top left corner of the AU home page. Alternatively, you can navigate to the student portal landing page located at http://my.athabascau.ca and click on the Log-in button there. The student portal (myAU) and staff portal (myAU – Staff) share the same log-in and validation pages, but different credentials are required to log in to each portal. Access to the staff portal requires the same user name and password that you would use to access your online Earnings Statement. 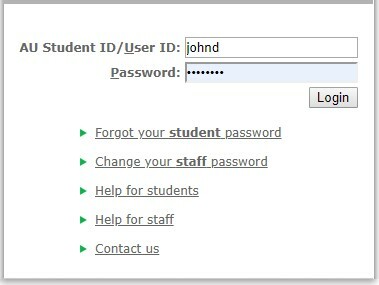 Access to the student portal requires a student ID number and a student password. Once you have clicked on one of the log-in buttons, you will be directed to a secure log-in page where you will be asked to validate your staff credentials. To log in to the staff portal enter your staff user name (the name you use to access your online Earnings Statement) in the User ID field and your staff password in the Password Field. If you have difficulty gaining access, please refer to the IT Services and Support Centre section below. Access to the staff portal requires an AU staff user name and a staff password. The staff password is the same password that you use to check online financial systems and services such as your Earnings Statement or Wellness and Professional Development Funds. If you are a new employee, you will be provided with an AU staff e-mail account by Computing Services, and your initial password will be set by default to your staff ID number. If you were not provided with these credentials when you were hired, please contact your supervisor. When you log in to myAU – Staff for the first time, you will be presented with a one-time screen prompting you to change your password. You can change your staff password at any time from within the portal. To do so, log in and click on the Staff Home tab and then click on the Change Staff Password button. Your new password must be six or more characters long and may not contain spaces. Select a password that you can easily remember and that is consistent with good password selection practices. If you continue to have difficulties gaining access to myAU – Staff, have lost or forgotten your password or are experiencing difficulties in changing your password, please refer to the IT Services and Support Centre section below. It appears that you are using Unknown version Unknown. Note: please ensure you have compatibility mode turned on if you are using Internet Explorer version 8 or greater. Full support - All web pages render correctly and all functionality in online applications works. Partial support - Most page webs are readable but may not render correctly and most core functionality in online applications works but this is not guaranteed. No support - Pages and online applications may or may not work. Athabasca University is committed to designing its website for maximum accessibility (To learn more about web accessibility visit the W3C: Web Accessibility Initiative website). Many of AU’s websites use relative font sizes. These sites allow visually impaired users to adjust the size of the text to meet their needs. Many people, without knowing it, have changed their browser's default setting. As a result, when they encounter a site that is using relative font sizes, the text may be unexpectedly large or small. There are many online tutorials that will teach you how to adjust your text size. This website should help you fix any text size problems that you may encounter. Athabasca University expects all staff members to have read and agreed to the Information Technology Electronic Data Security Policy. This policy statement details rules of conduct for use of university IT systems and the data contained on those systems. If you require clarification about any aspect of this policy, please contact your supervisor. If the myAU – Staff portal were a book, a tab would be a page in that book. The tabs are arranged horizontally across the top of the interface. A channel is a chunk of information within a tab. It is like a paragraph on a page. Channels contain some small, circular icons. To know what an icon means, roll your mouse over it. In most browsers, you will see a yellow box in which the purpose of the icon is explained. By clicking on minimize, you will collapse the channel into a smaller format. If you log out of the portal after minimizing channels, the portal will remember. The next time you log in, the channel will remain minimized. By clicking on maximize, you will make the channel bigger. If a channel is in the collapsed state, you can click on the maximize icon to read the content under the green line. When you click on a link to an external web page, or an AU application, a new browser page will open. This feature ensures that you do not lose your current page or leave the portal until you are ready. To close a new browser window, click on the X at the top right-hand corner of the browser window or use the keyboard method [ctrl] + [w]. To view and print files in portable document format ( - PDF), you will have to have a copy of Adobe Acrobat Reader or download a free copy of the Reader from Adobe. To view and print Microsoft Word files ( - DOC), you will have to have a copy of Microsoft Word or download a reader from Microsoft. Athabasca University is committed to providing you with websites that respect your privacy. Please read the Privacy Statement about conditions of use and privacy on AU’s websites. AU has reasonable processes and procedures in place to keep personal information safe and secure. When you enter personal information into an AU web form as part of a secure web transaction, your information is encrypted using the standard http secure (https://) Internet protocol. Once you have logged in to the portal, anyone can access your information from your computer as long as the browser connection is live. The best security measure, therefore, is to log out of your AU account and shutdown your browser after using the portal and related web services, otherwise anyone with access to the browser could use your account. Be wary of any program or web page that asks you for your account information (i.e., Staff ID number, password). Web pages that ask you for your account information will generally have URLs that begin with http://somename.athabascau.ca. The IT Services and Support Centre (formerly Computing Services Help Desk) functions as a technical call centre for AU students and faculty and staff members and provides additional support to users by ensuring optimum use of technology related resources. Phone: 1-800-788-9041, ext. 6405 (Canada/U.S.) or 780-675-6405. There is currently no training available for this system. For more information on training in general, e-mail train@athabascau.ca or visit the training site.